At the right, Taylor Keef of Hair Benders Internationale cuts Audrey Albritton's hair during a Cuts for Change event Monday, June 26, 2017, at Miller Park in Chattanooga, Tenn. Cuts for Change is an organized effort to inspire confidence and redemption through providing haircuts and hygiene packs to those in the community that can't afford them. Shaina Ramsey wanted to give back to her community by "spreading beauty." Ramsey, a hair and makeup artist at Southside Salon in Chattanooga, was inspired by Mark Bustos, a hair stylist in New York who offers free haircuts to the homeless once a week. So, she set out to organize an event called Cuts for Change here in Chattanooga. Cuts for Change is a community group dedicated to inspiring confidence and encouraging "community and redemption" by offering haircuts and hygiene packs to the homeless, according to its website, cutsforchange.org. It took Ramsey five months to plan the event and raise the money and donations, she said, and most of the volunteers were friends of hers. "When people get a haircut, they feel so good about themselves, and some people can't afford that," she said. "So, I wanted to give that to people who can't necessarily do that for themselves." 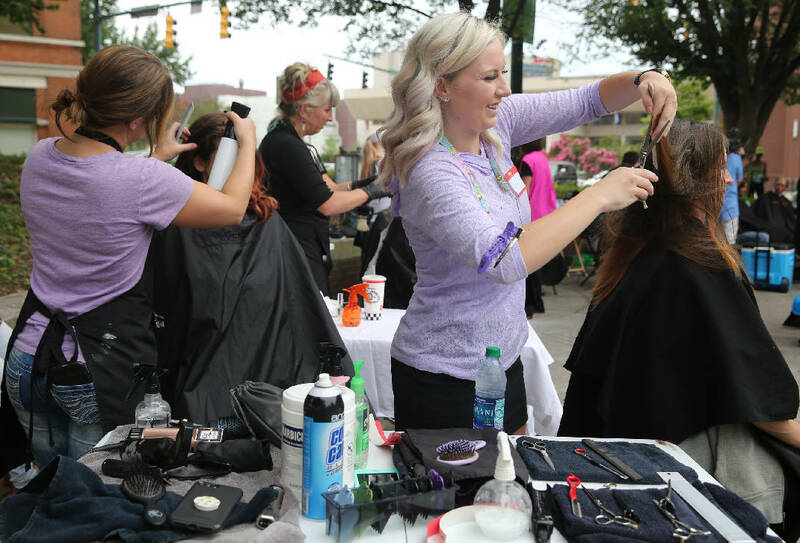 Tents were set up, lines were forming and stylists were busy cutting hair well before the event started at 2 p.m. Monday afternoon in Miller Park. Chelsea Mello Gilbert, a local photographer who was documenting the event, said 15-or-so stylists who were there early already had given haircuts to two people each. Gilbert said she heard about the event through Ramsey on Facebook and wanted to volunteer her skills. "I love to document real life and things that make a change and bring communities together," she said. About 40 stylists volunteered their time throughout the event, which lasted until 5 p.m. for haircuts and until 7 p.m. for distributing hygiene packs and warm food, helping the homeless register to vote, and educating them on their Medicare and Medicaid insurance plans. Ramsey said the Chattanooga Community Kitchen told her to expect 50-125 people to show up for services. That number was based on similar events the community kitchen has hosted before. One woman who was waiting in line to receive a hygiene pack, Irma Mendoza, said she heard about the event from a friend. "Society looks at us like we're the scum of the earth, but if only they knew!" she said. "We are the realest people on the planet, because we have to survive. We have to solely rely on God and each other, and we deserve to be treated just as good as the next person. We have dignity. We have pride. We have love." For many homeless people, their families have turned away from them, Mendoza said. But despite the hardships, she said the homeless community becomes a family to each other. "There's a lot of drug addiction here, but there's also a lot of love," she said. United Healthcare representatives also were present at the event, aiming to inform people about their health care options. "Some people just don't even know what kind of coverage they have, they just have all these cards," said Brian Wolf, one of the representatives at the tent. "So, we look at the cards they have and educate them on what options they have." Another group at the event was the League of Women Voters, Chattanooga chapter. Tennessee has a low voter participation rate, committee member Maria Sabin said, and state laws allow homeless people to register with the address of where they usually stay, which could be a shelter or even a street corner where they rest. "We wanted to help register people to vote so they have a voice in their government," Sabin, said. Ramsey said she plans to go back to school to get a degree in business or nonprofit management, and her goal is to turn Cuts for Change into a nonprofit organization and hold the event twice a year while hosting other events throughout the year to raise money.